I am so happy to join in Tracey McNeely’s 25 Days of Christmas Tags event this year. 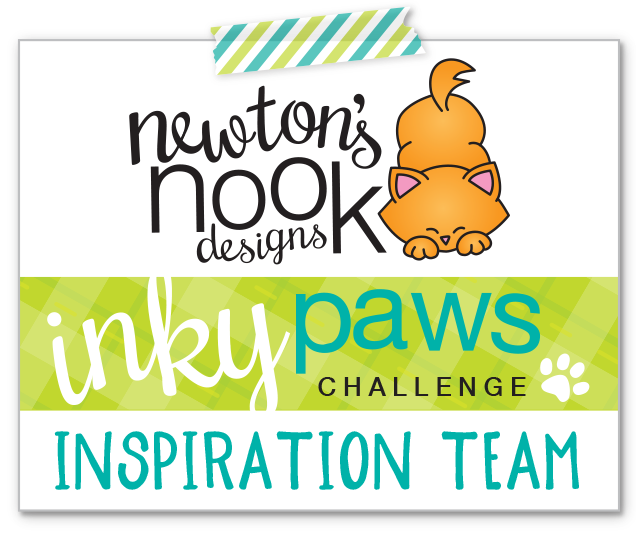 Today is all about Newton’s Nook Designs, so I created these cuties for this awesome event. I started with die cutting the base tag from the Fancy Edges Tag die set from patterned paper. I also die cut a white decoration for the bottom using a scalloped edge die from the set. On this I stamped the sentiment from the Holiday Stockings stamp set. I chose the cute kitty in the box image from the Newton Loves Boxes stamp set as my focal image. I stamped it on alcohol friendly cardstock, coloured in with Copic markers and used the coordinating die to cut it out. I also die cut 2 pine branches from white glitter cardstock using the Pines and holly die set. I added a white reinforcer to the hole and after I assembled the tag I realised that something is missing. I found the perfect little bow in the Happy Little Thoughts stamp set, which I coloured in red and added to the top of the tag. I finished it off with a chunky white twine. I wanted to create something classy too as inspiration for those of you who are not into the cute designs that much. I used the Tag times two die set to cut white tags and also black and white ones. On the white tags, I gold heat embossed different sentiments from the Ornamental wishes stamp set. I adhered the 2 tags together and added a black reinforcer before embellishing my tags with either a gold string or black and white twine. I hope you liked today’s inspiration and you will check out Tracey’s blog for details on how to participate in the 25 Days of Christmas Tags event and win some prizes!